A demonstrator wrapped in the EU flag takes part in a protest opposing Britain's exit from the European Union in Parliament Square following yesterday's EU referendum result, London, Saturday, June 25, 2016. U.S. Secretary of State John Kerry visits Brussels and London Monday, the first senior U.S. official to visit either location since the British vote last week to leave the European Union in a move that is of great concern in Washington. U.S. officials say Kerry - adding the two stops at the last moment onto a scheduled visit to Rome - will express U.S. support for Britain and stress the importance of other EU members remaining in the bloc. He said Sunday the U.S. regrets the "Brexit" vote, but vowed to continue a close relationship with what will soon become a 27-nation bloc of European countries. His talks in Brussels come amid a flurry of top-level diplomatic activity Monday, including the leaders of European powers Germany, France and Italy getting together to discuss what's next now that Britain is pulling out. 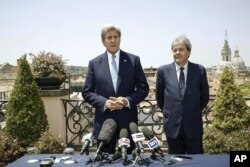 U.S. Secretary of State John Kerry, left, is flanked by Italian Foreign Minister Paolo Gentiloni, during a press conference that followed their meeting in Rome, Sunday, June 26, 2016. Kerry is then heading to London to meet with British Foreign Secretary Philip Hammond and other officials as part of a process of maintaining ties with Washington's top ally in a new era when Britain is less engaged with Europe. Outgoing Prime Minister David Cameron will hold a Cabinet meeting Monday while Parliament reconvenes in an attempt to figure out how to deal with what many thought would never happen; British withdrawal from the European Union. British Finance Minister George Osborne said Monday, "Britain is open for business." In an address designed to reassure the world's financial markets that have been thrown into a state of flux since the Brexit vote, Osborne said "the fundamentals of the British economy are strong" and Britain will "provide stability in these challenging times." He did, however, acknowledge "it would not be plain sailing in the days ahead." The British pound tumbled further Monday against the U.S. dollar, while most Asian stock markets posted gains. Japan's Nikkei index recovered more then 2 percent after a nearly 8 percent drop Friday. Hong Kong's Hang Seng closed down slightly, while key European markets traded down after opening, generally about 1 percent. 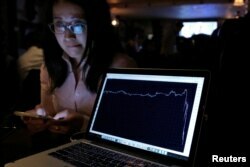 FILE - A woman watching the Brexit vote in The Churchill Tavern, a British themed pub, reacts as a graph shows the British Pound falling in value following the announcement that Britain would leave the European Union. EU members have called for a swift break with Britain, but Cameron has indicated negotiations for the divorce will not begin until he leaves office in October. European Parliament chief Martin Schulz said Sunday a period of limbo would "lead to even more insecurity." Cameron is expected to meet with the leaders of the other 27 EU members at a summit in Brussels Tuesday. Brexit has also sent Britain's Labour party into turmoil, with calls growing for party leader Jeremy Corbyn to resign. Corbyn issued a statement Sunday saying he will not stand down. Party members accuse him of having failed to galvanize support within Labour to defeat Brexit. Former London mayor Boris Johnson, one of the leaders of the campaign to leave the EU, is facing criticism from his opponents who say he does not have a plan to deal with the crisis the Brexit vote has triggered. Johnson, however, said in his column in the Daily Telegraph the negative consequences of the vote have been exaggerated. He said Britain would forge "a new and better relationship with the EU, based on free trade and partnership, rather than a federal system." The Brexit vote of nearly 52 percent in favor of leaving the EU has revealed deep divisions among the British, most notably with younger voters wanting to stay in the EU, while older voters wanting out. Some British voters said they decided to vote to leave the EU after U.S. President Barack Obama visited Britain in April and warned them against voting for a Brexit, telling them Britain would go to the back of the queue on trade deals if they voted "out." "We wanted our democracy back," said London voter Trevor Bayley. "I think your president unwittingly had a part to play in that... people didn't like to be told what to do." Meanwhile, 62 percent of voters in Scotland cast ballots to remain in the EU. Scottish First Minister Nicola Sturgeon said another referendum on Scottish independence from Britain is in now "highly likely" as a result of Britain's Brexit vote.